Last fall I had a chance to spend a little time with an old friend, watching her son play one of his last high school football games. She said something to me that I have pondered over the months. She told me that it is easy to pay attention to the firsts in your children’s lives: you know their first step and their first word, the first time you go to the beach and the first time they play soccer. It’s more rare to know when it’s the last time they will do something. You wake up one morning and realize a stage is over and you never had a chance to realize it was even slipping away. This perspective has been refreshing, and grown my patience. If I knew it was the last time my child would want to sleep in between us, would I kick her out of bed? If I knew it was the last time she ever wanted to play My Little Ponies, would I get down on the floor and play too? If I knew she was never going to draw for fun again, would I hang this picture up on the fridge? 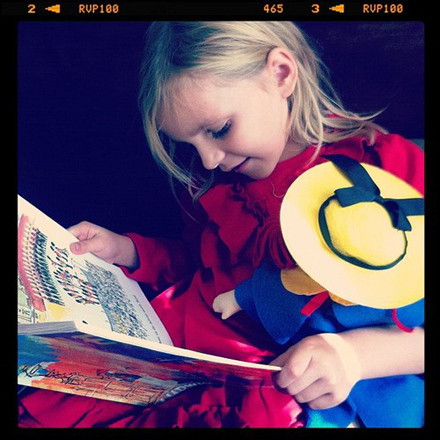 If I knew this was the last time she’d read Madeline to her Madeline doll, would I stop and listen? Pondering this was has led me to treasure up the sweetest, most childlike moments in my heart. I don’t know how much longer I my girls will be little and frolic in the splash pad or hold hands with their friends when they walk together. When Kate was a toddler, I couldn’t wait for her to be a kindergartener in a little plaid jumper. Now that she is in fourth grade, I wish I could slow things down. But as we continue to experience firsts together, I will choose to celebrate with my girls. Growing up is a big adventure. I am proud of them and enjoy seeing them tackle new challenges, even if there are moments I wish I could freeze them in time and keep them just the way they are forever.